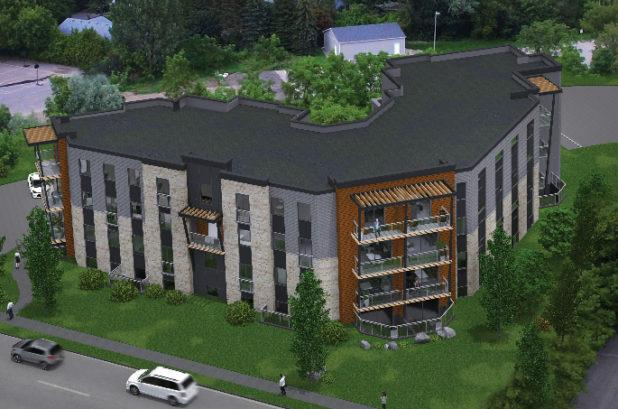 Orangeville landowners hoping to gain approval for a 3.5 storey ‘stackhouse’ complex on Centre Street finally got the thumbs up they were looking for on Monday. A zoning amendment for the proposed 24-unit apartment complex was approved in a 5-2 council vote Monday night (Aug. 13). A request will now go before a Local Planning and Appeal Tribunal (LPAT) hearing in the fall, where the town will officially endorse the move. One of the individuals involved with the “midtown” development, Erin Blackstock, informed Council the apartments would likely be available in the mid-$300,000 to low-$400,000 range on completion. All units will include open concept living room, dining room and kitchen, two bedrooms, two bathrooms, individual laundry facilities and will range from 1,080 to 1,353 sq. ft.
One of the sticking points for Council has been the number of parking spots the developer has reserved for the site. At the time of the initial application, the developers had planned 1.5 spots per unit, making a total of 36 parking spaces, which fell in line with municipal bylaws. In the time following the submission of that application, the town has increased the minimum required parking spots to two per unit. A public meeting for the development was held in March of last year, with staff receiving no comments in support or opposition of the rezoning application. Unhappy with the lack of progress in their application since that time, the developers launched an appeal with LPAT, citing a “failure of the municipality to approve plans or drawings and a refusal or neglect to make a decision on the zoning bylaw amendment application within the timelines prescribed by the planning act”. That hearing was scheduled for Nov. 28 to Nov. 30. At a meeting last June, Coun. Scott Wilson asked if the developer could increase the number of parking spots to fall in line with new municipal parking space requirements. Town staff followed up, conducted a report and determined the developer was not in a position to grant that request. Pending LPAT approval, the development, slated for 15, 17 and 19 Centre Street, will result in the demolition of a 142-year-old home that is currently listed on the town’s heritage registry. While the municipality has recognized the property, it is not currently protected under the Ontario Heritage Conservation Act. Councillors Don Kidd and Nick Garisto took the time to lament the lack of affordable housing in Orangeville, with Coun. Garisto specifically asking Ms. Blackstock if there was any appetite at all to open at least “a couple” of units to the community’s less fortunate. Ms. Blackstock noted the market at the time would primarily dictate the price point of the units. “We feel this will be the most entry-level housing that people can buy in Orangeville,” Ms. Blackstock noted.